Fourteen years into their recording career, Los Angeles rockers Radar Bros. return with their sixth album, once again adorning the Chemikal Underground catalogue with a great Californian psych-pop extravaganza. 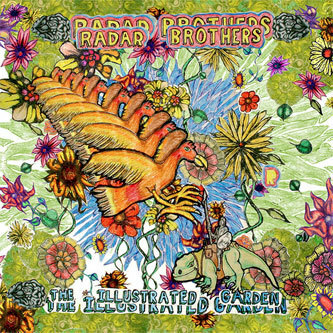 For The Illustrated Garden the band have a tweaked billing (Radar Bros. has become Radar Brothers) and a rebooted line-up based around the creative nucleus of frontman and producer Jim Putnam. 'Dear Headlights' proves a strong opening offer, latching onto a solid '70s style West Coast sound that brings to mind favourable comparisons with Grandaddy. A little further down the line, 'For The Birds' throws together slightly weirder chord changes all embellished by some winningly tooting brass, mellotron and a spot of whistling thrown in for good measure. Its companion piece (presumably that's the intention, at any rate) 'And The Birds' functions in a similar fashion and proves to be another highlight, rendering the band's sound in sparklingly crystalline electric guitars and a slow-burning, anthemic ascent towards another horn-laden conclusion. Although not necessarily an especially instant album, The Illustrated Garden makes up for its lack of urgency and adrenaline surges by rewarding every visit you pay it with an earful of pop classicism, warmth and craftsmanship.